JUBA, Republic of South Sudan -- The United Nations has accused Ukraine of defying an international embargo on South Sudan and supplying the country with weapons. 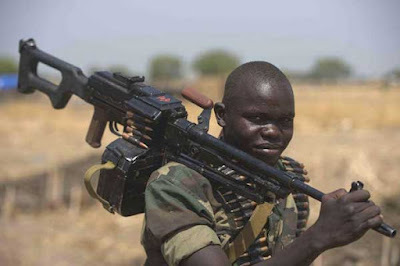 An armed South Sudanese government soldier poses near a village in Bor where an exchange of heavy artillery fire rocked the strategic town on January 26, 2014. The United Nations has accused Ukraine of supplying South Sudan with weapons. A report by the UN panel of experts monitoring compliance with the embargo, showed that Ukraine was supplying weapons blamed for perpetuating conflict in the famine-ravaged country. The report cited the case of an Ilyunshinil-76 aircraft that left Kharkiv airport in Ukraine, bound for Gulu, Uganda on January 27. It said the plane’s manifest indicated that it contained two L-39 jets and engines provided by Musket OU, a company based in Tallinn, and that the flight was operated by the Ukranian Defence ministry. “The Ukrainian Government confirmed that the two jets were listed as being operated by the Ugandan military and that the end user certificates indicated they were to be used only for pilot training,” the report read. The experts said they were investigating if the planes were taken to South Sudan following reports that an aircraft with obscure markings was parked at Juba airport. The panel said it was also investigating Hungarian fighter jet pilot — Tibor Czingali — contracted by the Ugandan Air Force, but believed to be flying South Sudanese aircraft. The experts said they recently received documents from a confidential source that detailed a contract, signed in June 2014 by two National Security Service officers for a company based in the Seychelles to provide weapons to the South Sudanese Internal Security Bureau, headed by Akol Koor. The contract covered a large quantity of weapons and ammunition. “Among the items are 30 T-55 tanks, 20 ZU-23 anti-aircraft weapons, 5,000 rounds of T-55 tank ammunition, 10 BM-21 “Grad” rocket systems, 10,000 122-mm M21OF rockets, 3,000 S8 rockets for Russian-made Mi-24 attack helicopters, 20 million rounds of 7.62X39mm ammunition, 50, 000 AK-47 assault rifles and 12,000 RPG-7 rounds. The report said border areas between South Sudan, Sudan and Uganda were key entry points for arms to Juba. The experts said they interviewed one Pierre Dadak, a jailed polish arms dealer who said between January and June 2014, the Sudan Peoples’ Liberation Army-In Opposition, under Riek Machar approached him seeking 40,000 AK-47 rifles, 200,000 boxes of ammunition, 30,000 PKM machine guns, 3,000 anti-tank rounds, 300 anti-tank guns and 300 anti-aircraft guns.